Iranian graduate students have an outsize footprint at U.S. engineering colleges, contributing to innovations ranging from soft robotics to novel ignition systems and energy-efficient cement production. Will President Trump’s immigration policy disrupt this research and education pipeline? Navid Kazem fits neatly into the research-driven, entrepreneurial culture that has helped turn Pittsburgh from a decaying steel town into a high-tech hub. Now in his final year pursuing a Ph.D. at Carnegie Mellon University, the Tehran-raised civil and environmental engineer is part of an interdisciplinary team behind “Thubber,” a stretchable composite of rubber and liquid metals that conducts heat and provides electrical insulation. The material could be used to create soft robots that won’t injure people nearby, lighted clothing for athletes, and heated garments to aid physical therapy. Once he graduates, Kazem might use his skills in soft materials in a start-up. Similarly, Faezeh Hajiaghajani’s doctoral work at Michigan State University could tickle a venture capitalist’s fancy. “She is developing next-generation electronic content-sharing algorithms for commercial contents such as coupons, news clips, emergency alerts, etc.,” adviser Subir Biswas, a professor of electrical and computer engineering, says in an email. And at West Virginia University, mining engineer Hassan Amini is developing new purification techniques that promise to add value in coal, metal, and mineral extraction. He already has found ways to remove iron contaminants to produce ultra-clean coal used in processing silicon for microprocessors and solar panels. Now he aims to apply rigorous modeling and simulation to separate high-grade copper and other metals from tons of mined materials more efficiently and with less environmental damage. President Trump campaigned on a pledge to bring about an “American economic revival.” But if the country is to restore its competitive advantage in manufacturing and revitalize the rust belt, including parts of Michigan, Pennsylvania, and West Virginia, it will need innovations arising from engineering research. That research, in turn, will depend on the millennial generation of engineering Ph.D. students working in university labs nationwide. And currently, more than half of this frontline infantry of invention hails from overseas. Iranians like Kazem, Hajiaghajani, and Amini represent just a sliver of some 1 million international students enrolled in American institutions. Yet they have an outsize presence in both engineering and U.S. graduate schools, particularly at the doctoral level. They bring rigorous undergraduate training and a strong work ethic to fields ranging from autos to construction to robotics while also breaking ground in such interdisciplinary fields as biomechanics. According to the Institute of International Education, 54.4 percent of the 12,269 Iranian students in the United States during the 2015-2016 school year were studying engineering—the highest proportion from any country—and 77.7 percent were enrolled in graduate school. The Council of Graduate Schools, an education and research advocacy group, reports that Iranians accounted for 8 percent of international applications for doctoral programs, “nearly as many doctoral applications as from the entire region of Europe and tied with South Korea.” They represented 6 percent of admissions to doctoral programs. Nearly three fourths (74 percent) of Iranian graduate students were enrolled in doctoral programs. Iranians also make up the largest cohort of students, by far, from the six mostly Muslim countries—Iran, Libya, Somalia, Sudan, Syria, and Yemen—named in President Trump’s revised March executive order imposing a 90-day ban on issuance of new visas to enter the United States. For Iranians, pursuing a doctorate here requires first surmounting steep academic hurdles at home, including graduating from a top public university. “In Iran, there is a big emphasis on math and physics. We worked really hard to master those topics,” says Carnegie Mellon’s Kazem. They also will have a near-fluent command of English—taught beginning in middle school and strengthened at one of a number of institutes around the country. Those who make it are “the strongest of the strong,” says Arash Zaghi, an NSF CAREER Award-winning University of Connecticut assistant professor of civil and environmental engineering from Iran who earned his doctorate from the University of Nevada, Reno, in 2009. Iranian graduate students must undergo interviews at a U.S. consulate in Turkey or other neighboring country, because Washington and Tehran severed relations in 1979. Most will arrive on a single-entry visa, meaning they have to apply anew after every trip outside the United States. A 2014 visit home by Maziar Fooladi, a mechanical engineering Ph.D. student at Clemson University, for instance, meant a six-month wait for a new visa. Rather than face such delays or even outright rejection, many Iranians go for years without seeing their families. Others, like Yousef Jalali, a second-year doctoral candidate in engineering education at Virginia Tech, “took the risk several times,” including going home for six months after losing his father to cancer. Following the presidential executive order, some are looking to delay graduation so as not to lose their student visas. Exactly what prompted consular officials to bar Saleh Rezaei-Ravesh, cutting short his mechanical engineering studies at Michigan State, remains a mystery to his wife, Malihe Gholami, who met him while both were students at Shiraz University. After returning to Iran for a visit in 2012, he was denied a re-entry visa. He subsequently won acceptance to a Ph.D. program in Canada but was again turned down for a visa. After a two-year lapse in pursuing his degree, he has now resumed Ph.D. studies at Uppsala University in Sweden. He and Gholami, a mechanical engineering Ph.D. student who remained in East Lansing, have been apart for more than four years. Why Iranians want to come here in the first place is an obvious question, given the 38 years of tension and recrimination between U.S. and Iranian governments since a revolution forced Shah Mohammad Reza Pahlavi into exile. Dubbed the Great Satan by Tehran, the United States, in turn, has condemned Iran as the world’s number-one state sponsor of terrorism. Mutual suspicion and various sanctions persist despite the landmark 2015 deal aimed at preventing Iran from acquiring nuclear weapons. Yet official enmity has coexisted alongside a willingness by Iran to send students here and of U.S. institutions to accept them. a relationship that began during the shah’s drive to industrialize his country. In addition, “there’s big support and a big push from families [in Iran] to go to college and get the highest degree possible, not just get a degree. If there’s an opportunity [to earn a graduate degree], you go for it,” says Connecticut’s Zaghi. While scientists and engineers inside Iran are largely cut off from the cross-border collaboration that has become routine for many U.S. researchers, numerous U.S. universities host visiting Iranian scholars. Some have gone further. The University of California, Davis, has had a long-term liaison with Iran begun in 2002 at the initiative of an Iranian-American alumnus and Sacramento businessman. The university signed an agreement in 2014 with Sharif University of Technology that today involves 10 faculty members, as well as undergraduate and graduate students. Since 2010, UC Davis researchers have co-authored 688 publications with Iranian counterparts, 157 of them in engineering. “Iranian academics are very eager and interested in collaboration in a wide range of disciplines and topics from arts and history to environmental sciences and hard sciences,” says Vice Provost Joanna Regulska. Often taught by Western-trained engineering and science professors, successive generations of students looked to U.S. graduate schools as a pathway to professional achievement and a chance to work with the best equipment and perform groundbreaking research. “I like to push boundaries and get out of my comfort zone,” explains Kazem, who earned a bachelor’s in civil and environmental engineering at Sharif University of Technology, often referred to as Iran’s MIT. Carnegie Mellon, a center of interdisciplinary research, opened up new topics that immersed him in studying mechanics, materials science, and soft-matter physics. He’s found that “all researchers are willing to explore new areas and are thinking out of the box.” His dissertation will delve into multifunctional composites using liquid metals, and low-melting-point alloys. Mohammad Kazemi says he was lucky to arrive here before a set of sanctions, since loosened, were imposed to exert pressure on Iran’s petroleum industry. He hasn’t disappointed his U.S. colleagues. Now nearing completion of his Ph.D. at West Virginia University, he’s become an expert in gas flows in shale formations, winning a Society of Petroleum Engineers regional student best-paper competition. Indeed, Iranian students generally are “the best and brightest and help us do what we do better,” says Gil Latz, president of the Association of International Education Administrators and associate vice chancellor for international affairs at Indiana University-Purdue University Indianapolis, which has had an engineering education partnership with the University of Tehran since 2007. Hajiaghajani, who admits to being “a little over-ambitious—I always dreamed of doing something really big,” wanted to come in part out of frustration. While at Tehran’s Amirkabir University of Technology, she had trouble obtaining the latest research information, usually published in Western journals. “At one point of time we couldn’t access IEEE Xplore articles,” she recalls in rapid-fire English. She was also drawn here because “the subjects are more diverse, and the highest-ranked universities are here in the U.S.” She appreciates, as well, the less theoretical approach of U.S. engineering and collaboration with industry. Hajiaghajani, whose thesis involves network routing methods for cost-effective information dissemination in social networks, eventually hopes to apply her training in artificial intelligence and machine learning to biomedicine. In Iran, she developed an application to help doctors monitor patients’ vital signs. “I get moved seeing someone in pain, like a child or an old person,” she explains. While working on her Ph.D., she’s been auditing courses in neuroscience and wants to explore early signs of autism in infants. Other Iranian Ph.D. students have equally ambitious research plans. Michigan State doctoral student Hamedani is currently researching wind shear and airflows in the university’s hydro- and aerodynamics labs. But like Hajiaghajani, he sees a future in biomedicine—in his case, designing better heart pumps. Meanwhile, at the University of California, Merced, mechanical engineer Soheil Fatehiboroujeni works at the intersection of biology, mechanical engineering, and applied mathematics to understand the mechanics of DNA and thereby advance gene therapy. Amini, who is given the honorific Seyed, for those traditionally recognized as descendants of the prophet Muhammed, intends to help companies “dramatically increase profit” with the efficiencies he can bring to metal separation. After earning a bachelor’s degree at Amirkabir University and his master’s at the University of Kentucky, he entered West Virginia University to join the research group formed by Assistant Professor Aaron Noble, whom he met at a mining conference. “In the U.S., we are the only people who work on this problem [modeling risk and uncertainty in mineral separation],” he says. While distressed by the forced separation from her husband, Malihe Gholami has nonetheless been able to channel her longtime fascination with cars and engines. At MSU’s Alternative Fuels and Combustion Laboratory, she uses high-speed imaging to create computational fluid dynamics models of turbulent jet ignition (TJI). The system allows for a large number of ignition sites and short combustion times, promising a 20 percent increase in fuel-burning efficiency and lower fuel consumption and carbon emissions. It can operate with petroleum as well as renewable fuels and fuel blends. The $1.3 million project, led by Assistant Professor Elisa Toulson, is funded by a National Science Foundation/Department of Energy partnership aimed at overcoming barriers to commercializing high-efficiency, low-emission internal-combustion engines. Also inspired by vehicles, Maziar Fooladi Mahani interned as a researcher at Honda, designing wheel-mounted motors that deliver precise amounts of torque to each wheel of an Acura SUV, increasing stability. At Clemson, he’s moved into autonomous vehicles and robotics. He’s part of a team working under Yue “Sophie” Wang, assistant professor of mechanical engineering, on “trust-based human-robot collaboration.” He explores ways to optimize this collaboration by, for instance, balancing a human’s reasoning ability and a robot’s ability to work without fatigue. International students ordinarily are free to work on unclassified basic research intended for publication. Iranians, however, face restrictions. According to CU, Iranian students may be barred from working on some research projects that involve export-controlled equipment, software, or technical data. A cautionary tale was the 2012 imprisonment of a University of Tennessee electrical engineering professor, John Reece Roth, for export-control violations, including use of Iranian and Chinese students in Air Force research. Visa and export-control anxieties aside, Iranian students say they’ve been treated well by their universities, advisers, and Americans generally. Gholami’s lab mates are “like brothers,” she says. Hamedani says supportive advisers have helped sustain him through years of separation from his family. “More than 99 percent of Americans have been welcoming and extremely kind,” says Kazem. While Iranian student organizations provide a social network for many, some have reached beyond this familiar circle. Kazem, who was president of the Pittsburgh Persian students’ association for a year and a half, is now president of the Carnegie Mellon men’s club soccer team. 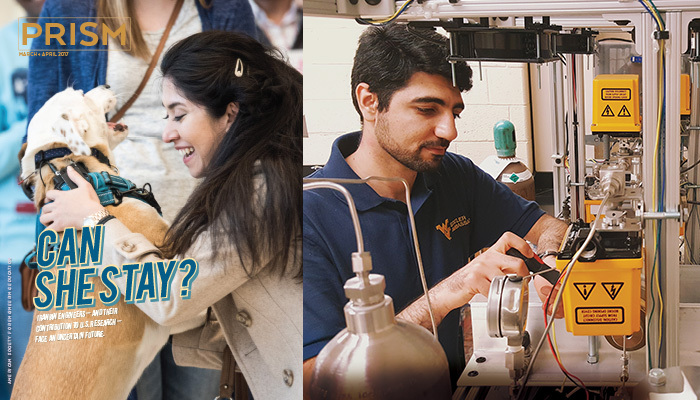 Kazemi is one of WVU’s engineering “ambassadors,” seeking to attract K-12 students into the field. Last summer in Merced, Calif., Fatehiboroujeni mentored K-12 teachers in designing classroom activities that show the interconnectedness of science, engineering, and technology. Looking ahead to careers, many hope to remain in the United States, at least for a while. Engineering students are allowed one postgraduate year of Optional Professional Training and may apply for a 24-month extension. That’s the path taken by recent Clemson industrial engineering Ph.D. Nazanin Zinouri. She joined Modjoul, a 12-member Clemson start-up focused on increasing productivity and safety by studying employee movements, as a data analyst and researcher. Recently, when Trump’s executive order temporarily barred her return from a visit to Iran, Eric Martinez, Modjoul’s founder and CEO, launched a #letNAZin Twitter campaign. “There’s a lot of opportunity here,” says Zinouri, noting America’s bigger companies and research labs. WVU’s Amini, unsure of future U.S. policies, thinks he’ll look at options in Australia. Several Ph.D. candidates want to remain in academia. “My own interest is to become a teacher sometime in my life,” says Kazemi, soon to complete his Ph.D. at WVU, who has already been offered a postdoctoral fellowship at the University of Kansas. Gholami will neither stay nor return to Iran. She’s headed for Sweden to reunite with her husband, taking along her expertise in ignition systems. Over the years, Iranian Ph.D. students “have had deep impact on research, technology, and thus ultimately the [U.S.] economy,” observes USC’s Sahimi. “But, there is also another type of impact; that is people-to-people relations, feeling good about the United States and its role in the world.” Actions such as the travel ban, he fears, may have a stronger and more lasting impact. Mark Matthews is editor and Mary Lord is deputy editor of Prism. California-based freelancer Alice Daniel contributed to this article.